Product code: ES8359 Categories: Art Deco, Art Deco Rings & Art Deco Engagement Rings. Australian opals are regarded rightly so as the best in the world and account for over 90% of the worlds opals today, and here is a very beautiful and elegant 18ct and platinum Art Deco solid opal and diamond cluster ring that sits so well on the finger. Hand made in such a traditional and classic design, in the centre sits a vibrant solid Australian opal that measures 1.60 carats and displays all the colour spectrum from blue to the desired red. There is such a wonderful spectral colour coming from this opal and showcases why Australian opals are so highly prized. The colour in this opal is fabulous and is highlighted by an elegant border of eighteen single cut diamonds that totals 0.54 carats. The cluster measures 16.5mm by 13.1mm and will perfectly sit on any finger where it will always be admired and appreciated for its beauty and elegance. 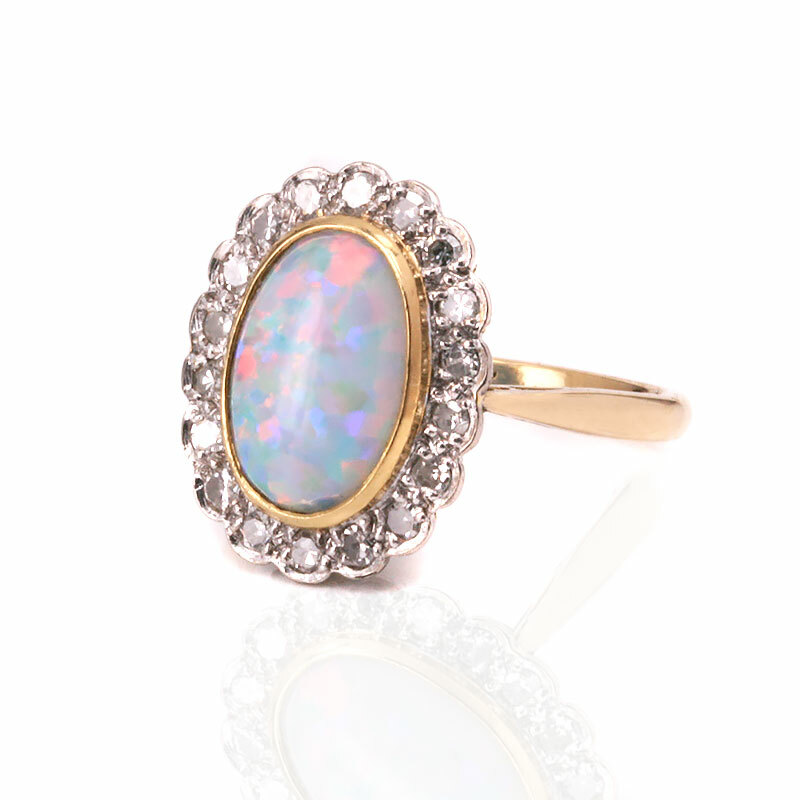 Tag: Opal and diamond ring. 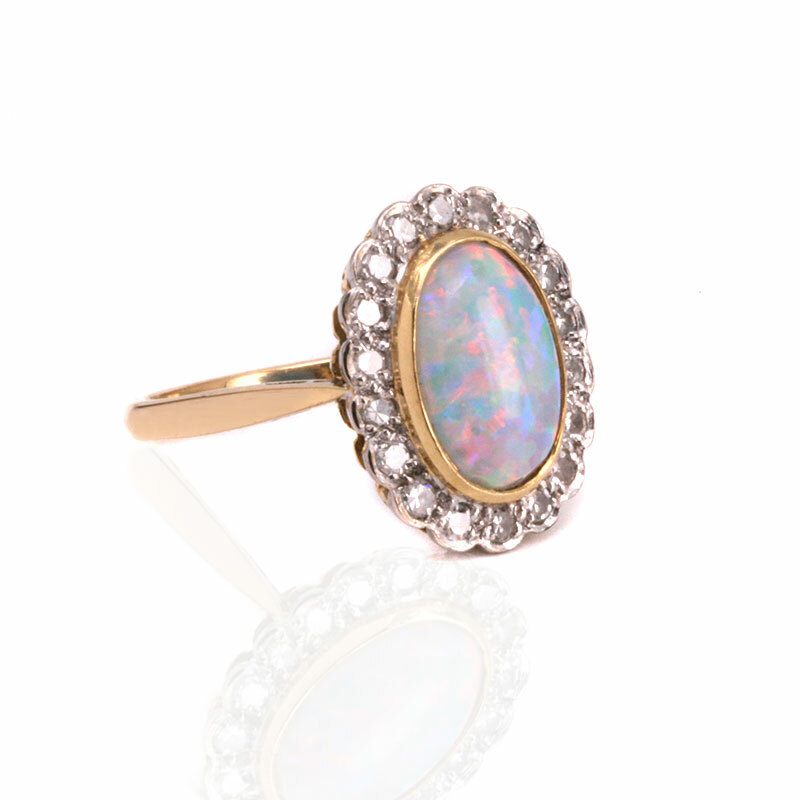 This Art Deco opal and diamond ring was handmade in 18 carat yellow gold and platinum. Set with a solid Australian opal, Australian opals are regarded as the best in the world. Producing over 90% of the worlds opals, they are are much less prone to cracking and breaking than Ethiopian opals.